He was on his makeshift raft for eight days and on the ninth day, a sea nymph called Calypso found him. She welcomed him with love and kindness. 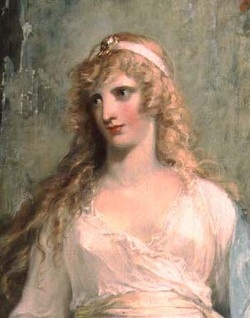 Calypso was very beautiful and she comforted Odysseus and he rested. She keeps him there and wants him to be her immortal husband. His days on the island soon became weeks, then months and then years. He stayed there 7 years before he prayed to Athena to help him get back home. Athena talks to Zeus and asks him to help Odysseus, and Zeus agrees to help with it. He sends Hermes to Calypso to tell her she must let Odysseus go, for it was not their destiny to be together. Calypso is not happy about this, but she lets Odysseus go, sending him off with food and a raft.